Bathrooms are one of those places where we tend to lose track of how much we accumulate. Containers of shampoo, lotions, mouthwash, makeup and hair potions quickly add up. Soon, we no longer know what we have and are on to buying the next hot product. Here are seven tips to help you keep your bathrooms organized. As a culture, we are taught that youth rules. Anti-aging creams and potions abound, and sometimes, even a lip gloss can be an inexpensive and tempting purchase to brighten our mood and make us feel young again (a la retail therapy). The best way to keep clutter out of the bathroom is to never bring it in or buy it in the first place. Only buy the products you need. 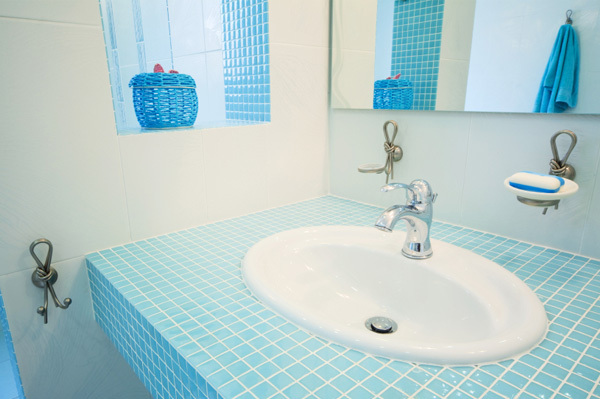 Keeping flat surfaces clear in a bathroom is about more than just eliminating visual noise. It’s a matter of cleanliness. Steam, moisture and condensation promote mold and mildew, which, when combined with countertop clutter, can create an unsanitary bathroom. Designate a place for every item and be sure to put it back in that place when you’re done with it. Rather than sentence the clutter under your bathroom sink to a lifetime behind closed doors, move it to multi-drawer bins in your hall or linen closet. Categorize toiletries and supplies, and label drawers by categories like teeth, nails, hair, medicine, medical supplies and cleaning. Then save the space under your sink to create a vignette of neatly rolled guest towels, candles and soaps so your bathroom says spaaaaaaah. To keep your bathroom looking streamlined, remove items like tampons and maxi pads from their store packaging and house them in pretty boxes under the sink. Opaque boxes with lids are also a great place to hide embarrassing prescription medicines and hemorrhoid creams (rather than in the medicine cabinet which can be opened and viewed by anyone). If you share a bathroom with anyone else, a label maker can keep the peace. Something about a label creates an obligation to abide by it, so label every bin, basket, and medicine cabinet shelf. Labels ensure that items are not tossed randomly back onto shelves and into drawers, leaving you searching for them, panic stricken, in an early-morning rush. If too many people share the bathroom, label shower caddies for younger family members to carry their toiletries to and from their bedrooms to keep the bathroom clear. Cosmetics are a breeding ground for bacteria. And since the FDA does not require expiration dates on cosmetics, it’s up to you to know when to purge. Leave the area the same as, or better, than you found it. And convince your family members to do the same.